What’s the best prize for a giveaway? How can you generate the most buzz about your Campaign? Why is it better to embed Campaigns than to publish them to Facebook? You’ve got questions about ShortStack and social media marketing, and we’ve got a team ready to answer them! Ask us anything about our platform or social media, and we’ll answer the top 5 user questions on the first episode of our new podcast, #STACKTALK, which will be out on April 29th, 10 a.m. PDT, on your favorite podcasting app. 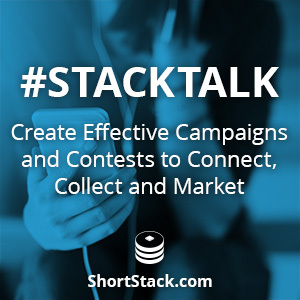 We’re launching #STACKTALK because a) we’re podcast junkies and b) we want to share our knowledge, research and expertise with you in as many ways as possible. If you’re already an avid reader of our blog, you’ll enjoy our show, and we’ll continue to share Campaign ideas and strategy, and review live Campaigns that our users have created. Every other week, we’ll be releasing a new 20-minute episode of #STACKTALK — perfect for listening during your commute on the way to the office, or your lunchtime stroll. Submit your questions by 5 p.m. PDT on Wednesday, April 27th.